‘Museum exhibitions and their visitors’ how do we approach learning in museums, research methodologies and “peer Feedback” as a tool to improve writing performance and critical thinking. will take as its departing point the methods used for conducting evaluation in museums. By discussing the ways in which researchers approach and explore learning in museums, the seminar aims at triggering inspiration regarding the methodologies one can use to explore a phenomenon or a question. In the seminar, we will also discuss the importance of ‘Peer feedback’ for improving writing performance and critical thinking. 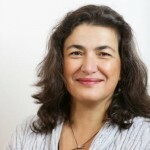 Dimitra Christidou is a senior researcher in the Department of Computer Science at the Norwegian University of Science and Technology where she is working for the H2020 COMnPLAY SCIENCE project.. Her research focuses on museum learning, visitor studies, multimodality, and embodied interaction. Dimitra holds a PhD in Museum Studies from University College London (UCL) and has worked as a researcher in the museum sector in Sweden, Austria and Greece.